Native Americans, as well as in folk medicine, the Prickly Pear has been used for reducing inflammation and to help increase stamina. The plants' properties have been used to boost the immune system, and the many nutrients help to keep the body's systems nourished. The herb is believed to lower fats and cholesterol in the blood and is becoming increasingly popular as a means to decrease blood sugar levels. It has also been useful in the treatment of burns, cuts, and wounds when applied externally. It has often been also been used to relieve the symptoms of overindulgence in alcohol, including dry mouth and nausea. In Mexico, the Prickly pear is consumed to address high blood pressure, ulcers, fatigue, shortness of breath, glaucoma, gastric acidity and liver disorders. Historically, and even recently, its properties have been touted for reducing inflammation and may be beneficial for certain types of arthritis, fibromyalgia, muscle and joint pain. The findings are that Prickly Pear fruits, and the cactus pads, help the body to resist stress, overexertion, mental and physical. Prickly pear stimulates health (and who doesn't need a touch of that) and is available in most grocery stores as food. Prickly Pear cactus, Opuntia spp, is a plant native to Mexico and the American Southwest and is now widely cultivated in many other parts of the world. It has long been used for 1000's of years in Central America as a supplement to help control blood sugar, lower high blood pressure and reduce fatigue. Since diabetes is sometimes tied to obesity, Prickly pear cactus extracts may be a natural way to promote both weight loss and be a significant food to help keep optimal glucose control. Prickly Pear may also help to control cholesterol levels. The interest in the plant is growing and is due both to the medical research and the wonderful taste of the fruit. The pectin and mucilage component in Prickly Pear helps to relieve digestive problems, relieve stomachache and irritable bowel syndrome. It may be particularly useful for nutrients, necessary for the health of the pancreas and liver, and to prevent fat and excessive sugars from entering the bloodstream. Prickly Pear is believed to be effective for hangover relief from overindulgence in alcohol. In tests, the greatest improvements were seen in symptoms of dry mouth, nausea, and that 'can't stand the sight of food' feeling. It does not appear to ease the other symptoms, such as dizziness and headaches. Prickly Pear contains vitamins B and C, beta-carotene, calcium, iron, potassium, magnesium, antioxidants, eight essential amino acids and has been used by Native Americans to increase stamina, worn out joints and for general soreness. An ideal fruit for anyone who leads an active life. Some professional athletes have found that they were able to go longer and stronger and recover from strenuous exercise more rapidly when taking the extract of Prickly Pear cactus. Spanish colonists used both the pads and the fruits for a variety of complaints involving inflammation. Traditional use of Prickly Pear has been for inflammatory skin disease, eye inflammation, urinary tract inflammation (gonorrhea), rabies, burns, joint and muscle inflammation, traumatic injuries such as breaks, muscle tears, strains, and sprains. Used externally, Prickly Pear joints are split open and applied as a heating pad for rheumatic symptoms. and arthritis. Applied to the skin in a salve, it is also used to provide topical relief for sunburn and windburn, wounds, rash, minor burns, hemorrhoids, spider and other insect bites and abrasions. Ingredients: Prickly Pear Cactus, Structured Water, 30% Alcohol. Non-Alcohol: Prickly Pear Cactus, Structured Water, Vegetable Glycerin. 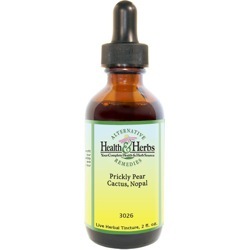 Contraindications: Pregnant and nursing women should not use Prickly Pear, nor should those who have severe liver or kidney disease, since there has been limited research into its effects. The herb may cause abdominal bloating, nausea and diarrhea, and it should never be taken in conjunction with prescription diabetes medications, because it may cause hypoglycemia (blood sugar that is too low). Diabetics should always monitor their blood sugar levels carefully. You should consult your healthcare provider before taking this, or any herbal supplement.